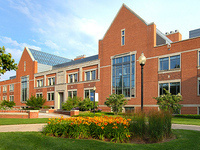 Learn more about the degree programs for chemistry at Hope College. We were one of the first in the country to offer undergraduate faculty/student collaborative research. Today, our research wins awards and gives students an edge after graduation. At Hope, you get the chance to take courses in chemistry and do real-world research with our award-winning faculty. As a student, you’ll enjoy small class sizes and state-of-the-art facilities, and join the ranks of successful alumni when you graduate. We offer an ACS-certified chemistry major with an optional emphasis in biochemistry (B.S. ), a chemistry major (B.S. or B.A. ), chemistry education major and minor, and chemistry minor options. Whether you plan to pursue a Ph.D., medical school and health professions, education or work in the chemical industry, our program will prepare you for success. For those interested in exploring the intersection of chemistry and biology, Hope offers two certified biochemistry majors (ACS and ASBMB) and a biochemistry minor. All of our students learn by doing, not just by lectures. Hope has the oldest undergraduate student research program for chemistry in the nation. As a chemistry student, you’ll have unparalleled opportunities to study and research alongside faculty members for innovative research. Visit our Research page for more information. During Dr. VanZyl’s tenure from 1923 to 55, the concept of collaborative research began. Hope became one of the first colleges to offer undergraduate student/faculty collaborative research. Between 1920–1980, Hope College ranked 2nd in the nation among 894 private undergraduate institutions for graduates who received Ph.D.s. Our chemistry and biochemistry students have achieved a perfect success rate over the last 10 years when applying to grad school. Our chemistry and biochemistry students have achieved a high success rate over the last 10 years when applying to medical school.